The Cling Film FP073 is 18' wide and 300m long. This product is commonly use in food preparation, wrapping, preserving food stuff. The FP078 Catering Foil 12'. This product is most commonly used food preparation, for wrapping and preserving. The Cling Film FP089 is 12' wide 300m long. 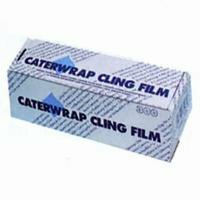 This product is commonly use in food preparation, wrapping, preserving food stuffs. To be used in conjunction with the (FP089) wrapmaster dispenser.